Today we went and got us a new treadmill. This was something we have been saving some money to buy. The old treadmill got hit by lightening a year or so ago. It has never worked right since then. However, it would work sometimes. Just frustrating to try and use. But, how can I complain much when the unit only cost $10 at a garage sale? 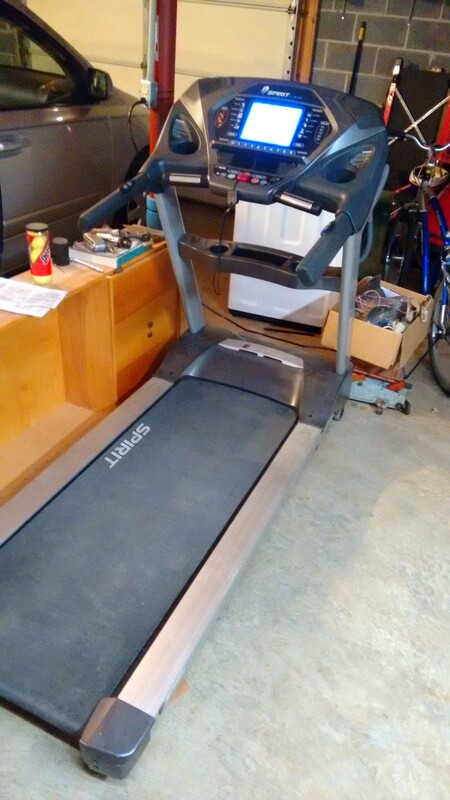 The new treadmill is a Spirit Fitness XT685. We bought it from Used Gym Store near Hickory, NC. It took the better part of the day to get there and back, but I think for the quality of treadmill we bought and the price we paid, it was worth the trip. The lady who owns the place was very patient while we asked questions and did some research on our phones to make sure we were really getting what we were expecting. Would highly recommend a purchase from them. I know most people don’t like running on a treadmill. I don’t know that I would prefer it over an interesting place to run. But, I have found that I am pretty bored with my neighborhood. To give me the motivation I need to do something consistently I have gotten to where I am depending more on the treadmill. I find that if I plan a trip to the beautiful state park that is just 10 minutes down the road to do a run, I tend to never make it there. In fact, I think I have planned to run at the state park 4 times in the last few months. I never made there a single time. As I mentioned in a recent post I have a challenge going with some folks that I work with to walk or run at least 1 mile every day for the month. The treadmill is definitely a help to that challenge during these colder weeks of the year. I am excited about having one I can depend on. This morning in church a friend, and former runner, came up to me and said, “I saw you gutting it out on a run yesterday.” Boy, his choice of words couldn’t have been better. It was a tough one. I ran 9.5 miles on an out and back route. It is generally uphill for the first half, though the hills are rolling so you don’t get as much of a sense of one half being significantly worse than the other. What was difficult is that I had no thought of any kind of wind on my way out. It wasn’t until I hit the turn around point that I realized that I had a tailwind pushing me the whole way. Though it wasn’t strong, the 5-7 MPH wind was very noticeable on the way back. By the time I hit the 6 mile mark I was ready to call my wife to come get me. I talked myself out of it, but it was tough. I even had the phone out and ready to make the call one time. I decided to try to make it one more mile before calling. By the time I finished that mile I was within a half mile from home. Also this morning in church one of the ladies came up to me needing to tell me something. She said, “I was thinking yesterday when I passed you while I was out walking I should tell you this.” I know I looked puzzled. I asked her when she saw me while she was out walking. She said that she had talked to me and I waved at her. It was then that I remembered there was someone who passed on the other side of the road, but I didn’t recognize her so I completely forgot about seeing someone yesterday. When she reminded me of the encounter this morning I remember thinking at the time that whoever it was talking to me mistook me for someone she knew, because I certainly didn’t recognize her. I thought that she was probably embarrassed when I spoke to her and she realized she didn’t know me. I was the one slightly embarrassed when I realized this morning that I should have known her. One of the fun things I enjoy while running is to see some of the odd things on the side of the road. Besides the tree full of 15 buzzards, I found a bunch of twine. I saw one piece that was probably 1/2 mile long. I kept thinking I would pick it up and bring it home as I ran by. But I talked myself out of it. Then when I saw a broken section, I decided to pick up the second string. As I wound it up I finally came to a parking lot where I saw the string was wrapped around a couple of poles and probably would not pull loose. I didn’t have any way to cut it, so just threw the big bundle I had over into the parking lot. At the end of the parking lot I saw the string again and decided to ignore it this time. I continued to watch it as I ran along. Not too far away, maybe a quarter mile, I saw the end of the twine and it was bundled up already. I found the source of twine and knew where the other end terminated. This time I picked up the bundle and started winding up what I had already run past. All this happened between about mile number 6 and 7. It provided 10 minutes worth of entertainment on an otherwise difficult return run. It has been a long time since I ran a half marathon. This is a distance that I call my favorite race length. Yet, it has been almost 2 years since I ran a half marathon. It is time to take care of that. I have been working on longer runs each week and trying to be more consistent in my workouts. Though traveling has thrown me off a little, I have still managed to get some longer runs each week. This week was an 8 mile run. The last couple of Saturdays have been difficult days to run (if I have been home). I decided that I would do my longer run during the week. I am a morning runner, but running for 8 miles (1 hour 30 minutes) means I would actually have to be disciplined and get up early before going to work. That meant I had to do an afternoon run if I was going to accomplish the task. Tuesday was chosen as that day. I planned to leave the office at closing time (4:00 pm) and run the 8 miles to my house. Of course, things rarely go as planned. I was on an international phone call until 4:45. By the time I got changed and out the door it was a little after 5:00. I was concerned about it getting too dark before I got home, but I had 30 minutes to spare when I got there. My wife was gone that afternoon and I was in charge of serving supper for the rest of us. Fortunately, she threw everything into the crock pot so that I did not have to actually make supper. The kids were ready for me to be home by 5:30 or 6:00. I finally arrived at 6:45. When riding my bike back and forth to the office it is exactly 8 miles. However, when running I can take a couple of short cuts. I ended up having to run 2 houses past mine before the GPS on my phone said I reached 8 miles. As I have always considered 8 miles to be mentally difficult, I know that I can do any distance now. Don’t know when I will get my 9 miles in, but I am looking forward to these long distances again. It is so nice to be able to write a race report again. It has been a year and a half since I ran a race. While I wasn’t training for a race today, I ran it anyway. We were driving through a town in Tennessee (looking for a house to live in) and we saw a small sign advertising a 5K. Though one day before the race is usually too late to register, I still looked it up online. This was the first year for the race and therefore they allowed race-day registration. I showed up at 8:00 for registration with a race start scheduled for 9:00. Other than the workers, there was only one other runner hanging around the registration table. Though we were not supposed to get a shirt after a certain registration date, the registration lady still had about 100 shirts in boxes to give out. There was no problem with offering shirts to late registrants. This was a good indication that I might be able to win my age group. They said they would give out prizes for first place in each group. 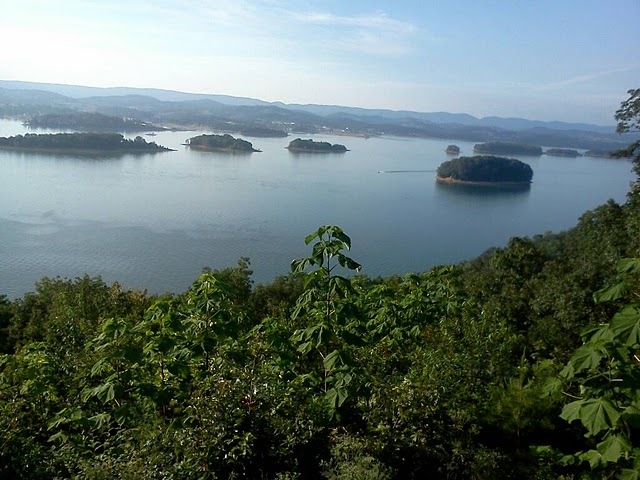 Because I had an hour before the race started I went to the top of the mountain of Panther Creek State Park, where we were running the race, and enjoyed the scenic overview of the lake for a few minutes. I warmed up as usual and headed to the starting line. There were only about 25 runners. From what I gathered, most of them signed up the morning of the race. There was even one man who came to the park for a normal run and saw that there was a race being held. Just a few minutes before the race started he jogged up to the starting line and joined us after registering. The course was pretty hilly. I expected that since I had run at this park before. 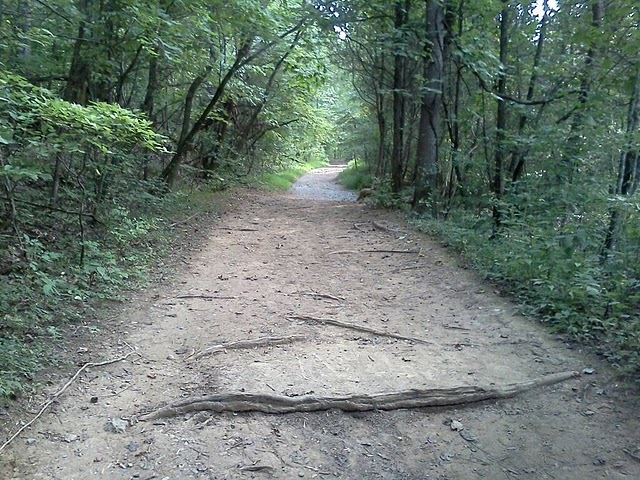 I was not familiar with the particular trails that we ran on. I had to do my share of walking on some of the uphill sections. This was my first time to run a trail race. I have always loved running trails, but all my previous races have been on roads. Within about 5 minutes of the start we spread out to our own little groupings. I never passed anyone else and no one passed me after that first few minutes. In fact, after about 8 minutes I didn’t even see any other runners for the rest of the run. I finished in 30:16. That is a slow time for a 5K for me. I don’t know if the distance was accurate. But I took solace in the fact that the first place runner had a time in the 25 minute range. It was a tough run for everyone. A meal was provided after the race. It was hot dogs with chili and hamburgers. There were no condiments. I thought it was a terrible meal to have after a 9:00 race. We were supposed to be interested in lunch at 9:45 in the morning? I would have rather had fruit or something with a potato salad. The lady mentioned that they thought about salads as a meal, but since it was going to be hot today they thought the salads would not go over well. I would take a salad any day over a chili dog immediately after a race. I liked the laid-back atmosphere of the small race, but was very disappointed with one change. The race registration form said they would give a prize to the first place winner in each age group. Since there were so few people, they decided to only give a prize to the first and second place men’s winners and the first place ladies’ winner. That meant everyone over the age of 25 had no chance of winning any prize. This was not announced until after the race was over. It should not have mattered that there were few people at the event. If they were prepared to give away 10 prizes it doesn’t make a difference if there are 20 people or 200 people at the race. It would still be 10 prizes given away that did not cost the organizers anything. The 3 prizes they did give away were all donated items. I assume the other prizes were donated as well. There was talk that the race was really under promoted. I wouldn’t know anything about that since I have only been in town a couple of days. However, if they want to make this race a success next year they need to make sure they promote it more heavily and not bungle the prize decision next time. I don’t know if I would have won my age group, but I never even got a chance to find out. I am glad for the chance to have run a race, but I would really have liked a chance to see if I could have won my age group. The end of June our family went on a vacation to the Iguazú Falls in northeastern Argentina. I made a conscientious decision to not run during the week. I took my running shoes just in case I wanted to, but I had been running fairly well up to that time and I knew our schedule would be somewhat tight. I also wanted to make the week about the family and not me. Taking a week off of running when I had been running well was not a problem. However, I did not anticipate how difficult the following two weeks would be. Trying to catch up on a bunch of projects right after being away for a week, plus having the 4th of July at the start of that week back home made it difficult to see the light at the end of the tunnel. We spent all day with friends on the 4th which kept me out of my running shoes. I was able to run on the 5th, but had to skip the next two days because of commitments. I was beginning to get worried that I would not get back on track like I wanted. But I was able to get a couple of good runs in on Friday and Saturday. I finished the week with 13 miles. That is not a spectacular number of miles, but it was refreshing to run as much as I needed to to stay on track with my base training. My marathon training plan does not start until the end of July. This week I planned to run 4 days. I wanted to run Monday, Wednesday, Thursday and Saturday. The week before I had something come up with work that would complicate this week. I really dreaded everything that I needed to do. Monday and Wednesday went as scheduled. Thursday I had to skip. But I had two great runs on Friday and Saturday to finish the week with 16 miles. That was exactly what I needed to do this week. I had two difficult weeks with schedules, but I was able to string together the right runs when I needed to. This is an encouragement to me to help me see that I can make the time to run when I need to. I have been making too many excuses lately about my running. But now it is “crunch time” for my training. When it came down actually getting on the road, I have been able to do it. Though I have not formally announced that I am running a marathon previous to this post, I have been looking very seriously at the Chickamauga Battlefield Marathon in November. This will be the third marathon I have trained for, but only my second one to run. I broke my foot on a long run in 2009 that kept me from running the race I was planning. More news to come as I plan and train for the race.